Ezra Klein of the Washington Post’s Wonkblog posted a blog post this week titled “Democrats don’t want to go back to Clinton-era rates” which pointed out that middle income and low income taxpayers had a substantially higher burden under Clinton. Klein is right: returning to those Clinton era rates would substantially increase the taxes paid by most of the bottom 80% of income earners and substantially decrease the number of nonpayers of the federal income tax. As such, many of the advocates of a return to Clinton era rates inadvertently make an economic case for higher taxes on middle and lower income taxpayers. 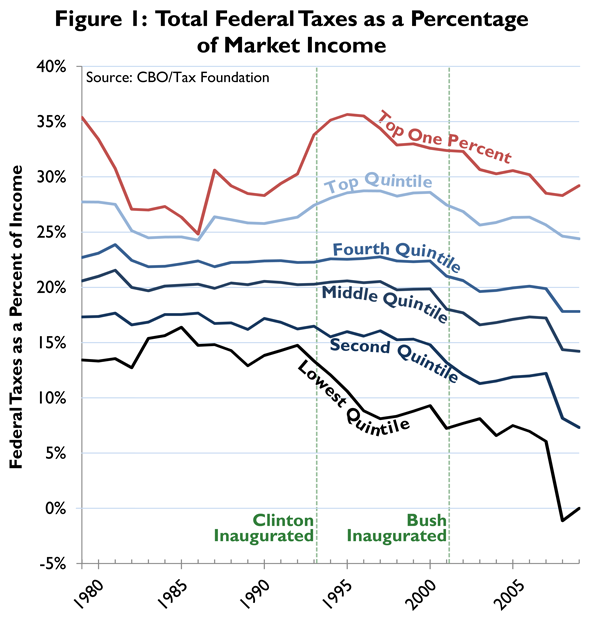 As Figure 1 shows, every income group saw decreased effective tax rates after Clinton left office. The second lowest income quintile paid 35 percent higher taxes on average in the Clinton years versus during George W. Bush’s tenure. The very lowest quintile paid 62 percent higher taxes on average during the Clinton years. Though taxes did come down substantially for the lowest income quintile during Clinton’s tenure, it’s still the case that the lowest quintile paid lower taxes during every year of the Bush administration, except for one year (2003) which at 8.1 percent matched the low of the Clinton Administration (1997). Perhaps most notable is the unprecedented drop that occurred for taxpayers, particularly the bottom 40 percent of taxpayers, with the most recent recession in 2008. As the chart shows, past recessions did not facilitate such substantial drops in effective rates. Even excluding this large drop following the 2008 recession, it’s still the case that taxes have trended downward for middle and lower income taxpayers substantially over the last decade. The change to the total federal tax burden of middle and low income tax payers is the result of changes to statutory rates and also the introduction and growth of tax credits. The growth of tax credits did not only lower effective tax rates for taxpayers, it substantially increased the number of nonpayers of the federal income tax. The average number of nonpayers was almost 25 percent in the Clinton years—substantially lower than the 32 percent average of the Bush years. These figures show clearly that taxes on the middle and lower income quintile have dropped substantially over the last decade, even after ignoring the effects of the recession. Though the Clinton years featured higher taxes on the rich, they also featured a more balanced tax code with higher taxes on middle and lower income taxpayers, and fewer nonpayers of the federal income tax. Those advocating a painless return to Clinton era tax policy should note the full implications of such a tax policy shift.